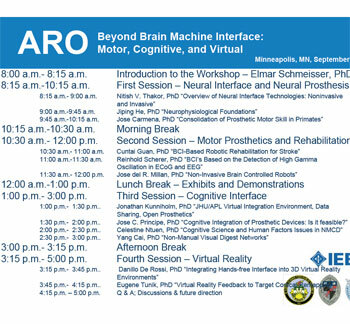 The Interactive Media Institute is planning an exciting and scientifically rigorous one-day symposium on Non-Manual Control Devices, which will bring together eminent experts working to offer a more efficient and intuitive way of achieving system control than manual manipulation, and allow for discourse and product exhibition among academics, members of the scientific community, biomedical device engineers, and the clinician user community. The scope of the conference is general in nature to focus on the interdisciplinary fields of biomedical engineering. Themes include topics such as imaging, biosignals, biorobotics, bioinstrumentation, neural rehabilitation, bioinformatics, healthcare IT, and medical devices. This symposium will also serve to advance the Army Research Office’s mission as the premier extramural basic research agency in the engineering, physical, information, and life sciences and invite presentations that contribute to a 5-year research and development “roadmap” for cutting-edge technologies. This symposium will be co-located with the September 3-6, 2009 31st Annual International Conference of the IEEE Engineering in Medicine and Biology Society (EMBS), which attracts 2,000 attendees from 50 countries. This year’s ARO-sponsored Non-Manual Control-Device Symposium will create a truly unparalleled scientific discussion, collaboration, and communication platform for attendees, presenters, and exhibitors. We invite you to attend and join the discussion.